Mallincam is the result of one man's passion for sharing astronomy with the world. Rock Mallin is an amateur astronomer just like you who felt there was a better way to see and share the night sky. Starting with commercially available video equipment in the mid-80's, Rock soon found that the market was lacking a true astro-video camera; a camera designed and built specifically for the amateur astronomer to observe the universe in real-time. 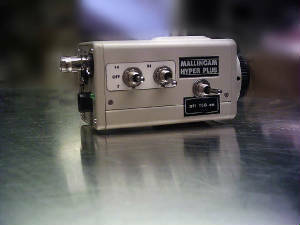 To that end in 1994 he took it upon himself to develop and market such a camera, the MallinCam. Since that initial camera model, Rock has developed an entire line of professional grade cameras designed for the amateur astronomer. You can read more about how Mallincam all started in a magazine article written by Rock Mallin himself called: "How It All Started". What sets MallinCam Video CCD Cameras apart from others? HANDCRAFTED IN CANADA FOR THE ADVANCEMENT OF ASTRONOMY NOT MONEY! What are some key features of a Mallincam that make it superior? The Highest Gain Available: The best way to improve the signal to noise ratio is to improve the signal. The signal comes from a high ﻿ga﻿in circuitry coupled with a High Quantum Efficiency ccd sensor of class 1 which significantly decrease the exposure time with a higher sensitivity across the entire visible spectrum. Unique "Selective Cooling" System(tm): Efficient Peltier cooling, carefully optimized for use in a video application provides: less dark current, less electronic noise, higher signal-to-noise ratio, faster image acquisition, more sensitivity, better live quality images. Please feel free to explore our site and learn more about our products. You can read past reviews of our cameras here, or find out more about how our cameras are made here. Never tried a MallinCam? If you do you'll never go back to any other!